Even before he won the 2009 world championship, Jenson Button's economical driving style - ultra-smooth, with minimal input and no wasted movement - had become something of a trademark. But it's interesting to consider how history might have viewed the Briton had Brawn not performed the mother of all phoenix tricks and turned the ashes of Honda into an instant race-winner. The promise was apparent early - an audition for a test role with Williams turned into a shoot-out with Bruno Junqueira for a race seat in 2000. He performed well as a rookie, but a mixture of circumstance and managerial intervention sent the Briton bouncing fruitlessly between Benetton, Renault and BAR until the latter's buyout by Honda. A win came at the Hungaroring in 2006, but as the team went into decline, points became ever more scarce. If nothing else, Button's career stands as a monument to the fine line between glory and obscurity. 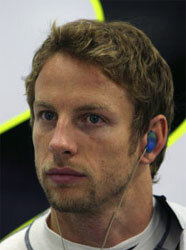 Should Jenson Button be higher or lower in F1's greatest drivers?